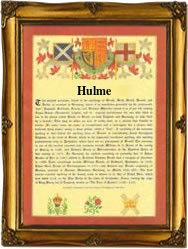 This interesting surname of English and Scottish origin with variant spellings Holme, Home, Hume Hulme, and Holmes, is a topographical name for someone who lived by a holly tree, deriving from the Olde English pre 7th Century "hole(g)n", Middle English "holin, holm" meaning "holly", "holm-oak". It may also be a topographical name for someone who lived on an island, in particular a piece of slightly raised land lying in a fen or partly surrounded by streams, deriving from the Old Norse "holmr" meaning "small island", or it may be a locational name from places called Holme in Bedfordshire, Derbyshire, Huntingdonshire, Lancashire, Lincolnshire, Norfolk, Nottinghamshire, Westmorland, and the East and North Riding of Yorkshire, deriving from the same element. The surname dates back to the late 12th Century (see below). London Church records include one George Hulme, who married Dorrytyr Coocke on February 16th 1602, at St. Michael Bassishaw, and Joane, daughter of Thomas Hulme, who was christened on August 9th 1612, at St. Andrew's, Holborn. The first recorded spelling of the family name is shown to be that of Roger de Holm, which was dated 1186, in "Sir Christopher Hatton's Book of Seals", Leicestershire, during the reign of King Henry 11, known as "The Builder of Churches", 1154 - 1189. Surnames became necessary when governments introduced personal taxation. In England this was known as Poll Tax. Throughout the centuries, surnames in every country have continued to "develop" often leading to astonishing variants of the original spelling.